FRENCH LICK, Ind. 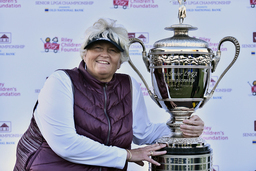 (AP) Laura Davies won the Senior LPGA Championship on Wednesday at chilly and windy French Lick Resort to sweep the two senior major events of the year. Davies birdied the final hole for a 2-under 70 and a four-stroke victory over Helen Alfredsson and Silvia Cavalleri. Still active on the LPGA Tour, the 55-year-old Englishwoman won the inaugural U.S. Senior Women's Open by 10 strokes in July at Chicago Golf Club. "This is fantastic," Davies said. "Winning the U.S. (Senior) Women's Open was a real thrill, and this is a golf course that I didn't think I could win on. So for me, this is a real victory. I've always played OK around here, but I've never strung three rounds together, I've always had one big number, so this is nice." "I wish there were more of them to play," Davies said about the two senior majors. "This was a real treat because I've never put three good rounds together on this course. With the wind today and the challenging layout, I think 2-under par was a really good score." "When you've got a three-shot lead those putts tend to go in," Davies said. "If I had to hole that to win it might not have gone in. So, that was a little bonus." Davies earned $90,000 for her 86th worldwide professional victory. In March in Phoenix, she tied for second behind Inbee Park in the LPGA Tour's Founders Cup. "She's always been an amazing golfer," Alfredsson said. "I think for us it's a bit different for us who only play about twice a year. Not to take anything away from her, she is an amazing player. But it's a little bit different when you play tournaments regularly still."